Available the Region X Conference at Lake Placid! Conference registrants may log in using their email and registration ID to build their conference itinerary, communicate with other attendees, and prepare for their conference experience. The mobile app is also available for download in the iTunes store and Google Play under 2016 NAFSA Regional Conferences. Please click the button on the right-hand corner under Registration to begin! Region X provides a discount for students, retirees, as well as academy trainees and diversity impact participants. The special rates will be noted in the registration system once required documents are uploaded. For more information, please contact our Conference Planner Designate, Amy Harvey, at goodmana@stjohns.edu. Conference badges and materials may be picked up at the Registration Table at the Conference Center at Lake Placid beginning on Sunday, October 23rd from 5:00-7:00pm. Registration Cancellation Policy: Conference registration and/or workshop registration may be canceled with full refund less $30 processing fee, provided written notification is received any time up until four (4) weeks prior to the conference start date. A 50% refund is available for conference registration and/or workshop registration provided written notification is received between four (4) to two (2) weeks prior to the conference start date. No refunds will be granted within two (2) weeks of the conference start date. In the case of emergency/extenuating circumstances, special requests may be considered on a case-by-case basis by the regional leadership team following the conference. Please see contact information on your 2016 NAFSA Regional Conference Attendee Confirmation for contact information for registration cancellation. We look forward to seeing you as we "Go For the Gold!" There is only one train per day leaving New York. The train arrives at Westport, NY which is about 25 miles away from Lake Placid. The connection from Westport to Lake Placid is via van service. The train leaves Penn Station daily at 8:40 am and arrives in Westport, NY at 2:04 pm. The van leaves Westport, NY at 2:40 p.m.and arrives at Lake Placid, NY at 3:25 pm. Our region has received a discount rate from Amtrak for our conference. Please follow the direction below to use the discount code. The discount cannot be used for online reservations. Amtrak offers a 10% discount off the best available rail fare to (Lake Placid, NY) between (October 21, 2016 – October 29, 2016). To book your reservation call Amtrak at 1 (800) 872-7245 or contact your local travel agent. Conventions cannot be booked via Internet. Please be sure to refer to Convention Fare Code X69C-957 when making your reservation. This offer is not valid on the Auto Train and Acela Service. Fare is valid on Amtrak Regional for all departures seven days a week, except for holiday blackouts. Offer valid with Sleepers, Business Class or First Class seats with payment of the full applicable accommodation charges. Get Excited About Lake Placid! IMPORTANT NOTE: Golden Arrow Lakeside Resort is currently sold out. However, if any Region X member cancels a room, Golden Arrow Lakeside Resort is willing to provide the conference rate for anyone taking the room. Please call Golden Arrow Lakeside Resort directly to check if they may have rooms available or if anyone canceled. Additionally, our alternative hotel, Hampton Inn & Suites Lake Placid, has graciously extended the conference rate until Friday, October 14th. Please follow the link below for Hampton Inn & Suites for reservations. Conference Hotel: Golden Arrow Lakeside Resort - Sold Out!! Cancellation Policy: Cancellation cut off will be Friday, October 21, 2016 (48 hours) prior to the arrival date. Attendees can cancel an individual reservation up to 48 hours prior to arrival by calling the hotel directly. There will be a $10 processing charge for the cancellation. Inside of 48 hours any cancellations or nights dropped will be subject to charge. The amount charged will be equivalent to a one night stay. As the overflow hotel for our conference, the Hampton Inn & Suites Lake Placid has a variety of rooms available for Monday, October 24, 2016, and Tuesday, October 25, 2016. Room rates average between $135 and $185 per room per night, plus applicable tax and service charge. To reserve a room, please follow the link here: Hampton Inn. Individual reservations must be made by Saturday, October 1, 2016. Any room reservations made after that date will be charged the standard rate and subject to availability. Cancellation Policy: If individual cancellations occur, the individual must cancel 72 hour prior to the arrival date. Any cancellations within 72 hours prior to the arrival date will result in a cancellation fee equivalent to 1 night's room & tax. Expo sales is now OPEN! Please click the button on the right corner of this page to begin! It's that time of the year to start planning for the 2016 NAFSA: Association of International Educators Region X conference at the beautiful Lake Placid. We hope we can count on you to help support this year's Region X conference. We look forward to seeing you as we "Go For the Gold!" Please feel free to contact your Marketing and Development Representative, Emilie Buse, at ebuse@pratt.edu. The Call For Session Proposals is now Closed! The Call for Session Proposals is officially closed. Decisions on session proposals will be communicated by mid-August. 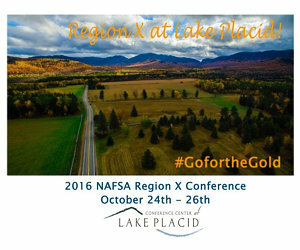 The NAFSA Region X Conference will take place in Lake Placid, NY from October 24-26, 2016. Our theme this year is "Go for the Gold!" Region X has a history of fantastic proposals and diverse offerings across Knowledge Communities; this year will be no different! It is time to put on your (creative) thinking caps. We are encouraging collaboration with colleagues and are looking for your best proposals to make the conference a truly spectacular event. If this is your first time submitting a proposal, there is no better time than now to develop those ideas you have. Don't miss this opportunity to explore and share ideas, directions, and trends in the field through sessions, workshops, and posters. If you attended the annual conference in Denver and were impressed with a topic that you think Region X needs to hear, take that topic and put your own spin on it and present it in Lake Placid! All proposals must be submitted electronically. Submit a proposals now. You will have to log on to the NAFSA website with your login before you go to the proposal page. Please note that all presenters must verify their information prior to submission. Please plan accordingly. The Region X Team will review all proposals submitted by the end of July. The Chairperson of your proposed session will be notified in August with decisions. We look forward to hearing from you, and encourage you to submit session proposals that incorporate presenters from across all Knowledge Communities. Questions? Email them to your Chair Elect at nafsax.chairelect@gmail.com.